A brown leopard cardigan and a tan leather satchel bag are absolute must-haves that will integrate nicely within your current off-duty lineup. And if you want to immediately bump up this outfit with shoes, introduce beige leather pumps to the equation. 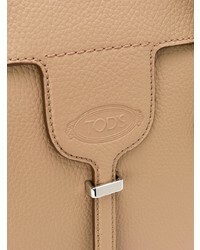 Pair a beige sleeveless coat with a Tod's joy medium tote, if you feel like comfort dressing without looking like you don't care. Dress up your getup with beige leather pumps. 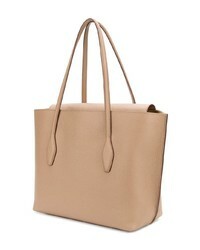 Pair a white blazer with a Tod's joy medium tote from farfetch.com, if you want to dress for comfort without looking like a slob. A pair of beige leather heeled sandals will add more polish to your overall look. If you're all about relaxed dressing when it comes to your personal style, you'll love this absolutely chic pairing of a grey cropped sweater and a Tod's joy medium tote. You could perhaps get a little creative in the footwear department and lift up your ensemble with white leather pumps. If you're obsessed with functionality dressing when it comes to fashion, you'll love this absolutely chic pairing of a pink knit open cardigan and a tan leather satchel bag. Bump up the cool of your look by complementing it with tan suede over the knee boots. If you're after a casual yet stylish look, rock a beige fur coat with a tan leather satchel bag. Both garments are totally comfy and will look fabulous together. Sporting a pair of black leather ankle boots is an easy way to add extra flair to your look. 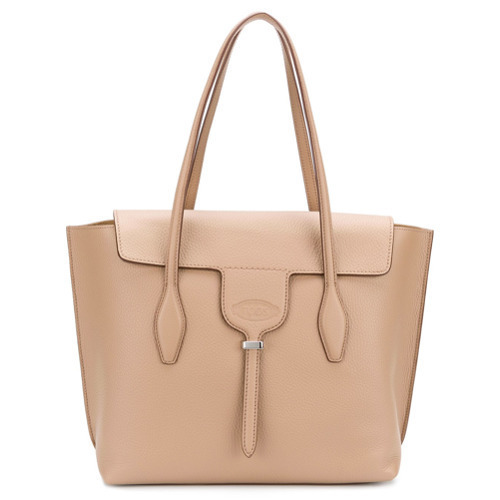 If you're a fan of relaxed dressing when it comes to your personal style, you'll love this super cute combo of a beige open cardigan and a Tod's joy medium tote. When it comes to shoes, this look is finished off wonderfully with brown leather thong sandals. If you're all about being comfortable when it comes to dressing up, this combination of a camel coat and a Tod's joy medium tote is totally for you. Look at how well this ensemble is complemented with white low top sneakers. If you're all about relaxed dressing when it comes to fashion, you'll love this chic pairing of a navy blazer and a Tod's joy medium tote. Got bored with this ensemble? Enter white leather pumps to shake things up.